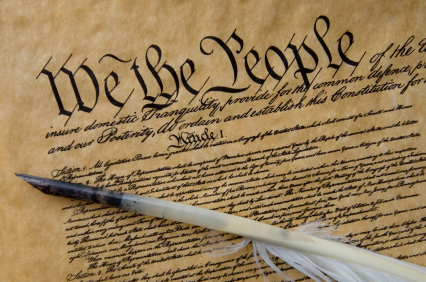 I'm still amazed at the debate over the second amendment of our nation's articles of amendment or bill of rights. That people are debating the meaning of what is so blatantly obvious, reveals quite a lot. What part of: "A well regulated Militia, being necessary to the security of a free State, the right of the people to keep and bear Arms, shall not be infringed." - is so difficult to understand? Those who want only the state to possess the force of arms, who want the state to have a monopoly on the use of force - claim that only state-sanctioned bodies (FBI, ATF, CIA, Police, military…) have the right to keep and bear arms under this amendment, completely ignoring what the Bill of Rights is about, which is the protection of individual liberty, something the state is diametrically opposed to by its very nature. You see, as government increases, as every aspect of our lives is legislated and codified in volumes and volumes of laws, we lose our freedom. Simply put, as government increases, liberty retreats. Collectivists, by their very definition - are not concerned with individual liberty, but are only concerned with the supposed "rights" of the collective, or the group. Well, the group isn't an individual. So, by placing emphasis on the collective, they strip away individual liberty, which is why collectivism (also known in various forms as communism, socialism, fascism, Nazism, Marxism/Leninism) is opposed to the American way. The second amendment was written to ensure that the collective, using our common government, doesn't trample on individuals. The second amendment was codified so that as a last resort, if the collectivists were taking too much liberty via our own government, they could be brought under control by a group of individuals, each armed with their own firearms. Simply put, the second amendment says that in order to keep us all free, the ownership of firearms by individual citizens will not be interfered with - so that if it becomes necessary, those individuals (the people) can unite their force, forming a militia to repel either foreign or DOMESTIC enemies. Also consider that no state entity, no state-sanctioned body can be considered a militia. The founders were quite explicit on this point, revealing their thoughts on this matter plainly in their writings and also in our Constitution. They were against any standing army because these entities had historically been a source of great danger where individual liberties are concerned. The founders did NOT want the state to have a monopoly on the use of force because that would have contradicted their very reason for forming the type of government they did, having just fought and defeated the largest standing army on the face of the earth at that time - with armed farmers, woodcutters, shipbuilders and pitch and turpentine harvesters. Also: in section eight of the United States Constitution, the militia is treated with - separately - from the land and naval forces, meaning that the authors of that document thought of the militia as being separate from the army and navy, both of which are STATE entities, NOT a well-regulated militia (…being necessary to the security of a free State, the right of the people to keep and bear Arms, shall not be infringed)! Now, some interpret this to mean that the militia are the police or the national guard. Well, both of these are organs of the state, not of the citizenry or "the people" and you will have just identified a statist, also known as a collectivist - by hearing that interpretation from some individual. Remember: our form of government was designed such that we are self-governing, that the state does not possess a monopoly on the use of force. Government is here to serve the people, not the other way around. So, individuals have the right to keep and bear arms in order to form a militia so that they can repel domestic enemies which include an over-burgeoning state. Of course, you might expect that the "domestic enemies" might form a lobby, they might unite to oppose our self-government, they might try to steal away those rights which protect individual Americans - by trying to change the meaning of the Bill of Rights. Particularly in the case of the second amendment, domestic enemies want to take away their victim's means of repelling their onslaughts. So, they've mounted a campaign to distort the original meaning and intent of the second amendment, attempting through guile what they cannot accomplish (yet) through rule of law or through force of arms. Yes, the domestic criminal, collectivist lobby must try to eliminate our right to keep and bear arms if they are to be successful in enslaving us. The easiest way for them to do this is to undermine the meaning and intent of the second amendment. Thus, they are constantly trying to transmute an individual right, codified in the Bill of Rights - into a collective right, or one that is only possessed by a group, which would mean the state. Well, how can we maintain the security of a free state - by handing over our arms TO THE STATE, the very entity that's taking away our freedoms under color of "public welfare"? Even on the face of it, this argument is ridiculous. It should be obvious to all that we cannot maintain a free state by surrendering the means to maintain it. So, when you hear someone calling for so-called "reasonable gun control" or for some other infringement on our right to keep and bear arms as individual citizens, you have identified a domestic enemy, one who would remove your means of maintaining a free state. Your job would then be to do the reconnaissance, work up a mission and await the signal. From all the signs, I suggest you get on that right away.